Once the visual inspection is complete, one of two activities must be conducted in order for the area to be cleared for use; the first option is that a Certified Renovator must perform a cleaning verification. The second, another certified professional must conduct a clearance examination. If the first option occurs, here is what to expect in terms of what the procedure looks like. Window sills, countertops and floors will be wiped using a single, wet, disposable cleaning cloth. The cloth must remain damp while in use. If the surface area of the countertops or floor within the work area are greater than 40 square feet, the surface within the work area must be divided into roughly equal sections that are each less than 40 square feet. Wipe each surface section separately using a new wet disposable cleaning cloth. If the cloth used to wipe each surface section within the work area matches or is lighter than the cleaning verification card, that surface section has been adequately cleaned. 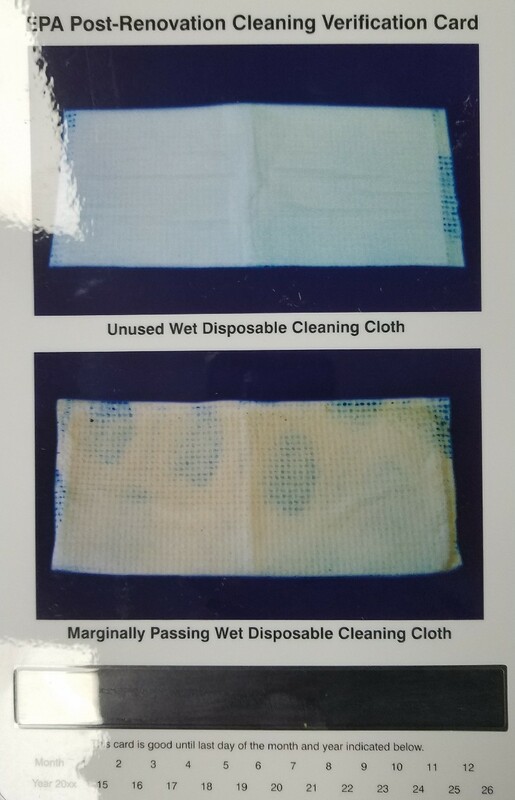 If the cloth is darker than the cleaning verification card, re-clean that surface section, then use a new wet disposable cleaning cloth to wipe the surface section. If the cloth matches or is lighter than the cleaning verification card, that surface section has been adequately cleaned. If the second cloth does not match and is not lighter than the cleaning verification card, wait for 1 hour or until the surface section has dried completely, whichever is longer. Then wipe the surface section with an electrostatically charged white disposable cleaning cloth designed to be used for cleaning hard surfaces. The cleaning verification procedure is now complete and the surface is considered clean. When cleaning verification has been completed for all of the surfaces in the work area (including window sills), warning signs and barrier doors may be removed. To find out how to document your cleaning verification procedure, attend one of our EPA RRP Lead Renovator Initial Certification courses by registering here. Recent Article Shows Lead in Drinking Water Leads to Higher Miscarriage Rates!